Call Me Jorge...: Francis venerates a Russian Orthodox saint! Francis venerates a Russian Orthodox saint! The Russian Orthodox are almost as frequent visitors to the Vatican as the Talmudists are. 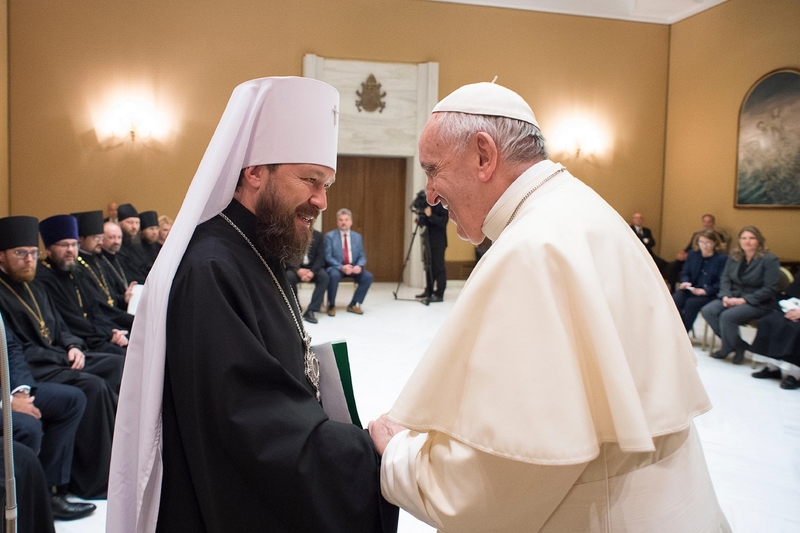 Francis met once again with his friend, Metropolitan Hilarion (Alfeyev) of Volokolamsk, chairman of the Moscow Patriarchate’s Department for External Church Relations. The two have known each other for some time and were introduced by the late Rabbi Angel Kreiman who, as a Cooperator of Opus Dei, met Hilarion at an interfaith congress held at one of Opus Dei’s universities. (Rabbi Kreiman was Francis go to rabbi until he died.) One wonders what these two chums discussed that didn’t make the official record — communism or navel-gazing? Metropolitan Hilarion of Volokolamsk is a frequent visitor at the Vatican and he usually brings a delegation of orthodox with him. This time the group was rather large. In the public statement, Francis concedes to Metropolitan Hilarion’s complaints from 2014 concerning “Uniatism”, Greek Catholics, and the Ukraine. Francis told Hilaron and the delegation from the Russian Orthodox Church (ROC) that the Vatican under him has abandoned the goal of converting the members of the ROC to the Catholic Faith and also doesn’t care about correcting the errors in their beliefs. Francis said further that he and Kirill are brothers that are spiritually walking together. Perhaps, Francis is running a scheme with cigarettes à la the “Tobacco Metropolitan”? After all, calculating Francis must of had an ulterior motive for prohibiting the sale of cigarettes to Vatican employees. Or is this Francis’ way of stating that he is a communist and agrees with the goals of the KGB-agent (codename ‘Mikhailov’) Kirill? Francis told the ROC delegation and the world that he (like John Paul II) regards the navel-gazing (hesychast) sympathizer of the Old Believers, Seraphim of Sarov, a saint and further that he venerates him twice a day! Wow, what else does one need to know? Francis doesn’t want to convert the Russian Orthodox people, or correct the errors of their church, and he venerates one of their saints! Thank you so much for your visit, and also for this meeting, which helps us so much to live our faith in unity and in the hope to walk together. I am happy to take the road of unity with you: the only road that promises us something certain, because the path of division leads us to war and destruction. And before you I would like to reiterate – in a special way before you, my dear brother, and before all of you – that the Catholic Church will never allow an attitude of division to arise from her people. We will never allow ourselves to do this, I do not want it. In Moscow – in Russia – there is only one Patriarchate: yours. We will not have another one. And when some Catholic faithful, be they laypeople, priests or bishops, raise the banner of Uniatism, which does not work anymore, and is over, then it causes me pain. The Churches that are united in Rome must be respected, but Uniatism as a path of unity is not valid today. Instead it brings me comfort when I find this: the extended hand, the fraternal embrace, thinking together, and journeying. Ecumenism is made by journeying. We walk. Some think – but this is not right – that there must first be doctrinal agreement, on all the points of division, and then the journey. This does not work for ecumenism, because we do not know when agreement will come. I once heard a man of the Church, a man of God, who said: “I know which day a doctrinal agreement will be signed”. They asked him: “When?” – “The day after the coming of the glorious Christ”. We must continue to study theology, to clarify the points, but in the meantime let us walk together, let us not wait for these things to be resolved in order to walk, no. We journey together and also do this, but walking in love, in prayer; as in this example of the relics. Prayer together, for each other, in dialogue. This is so good. The meeting with His Holiness Kirill was very good for me, I found a brother. And now, spiritually, we walk together. And a couple of words to finish. One on the respect of Catholics towards you, Russian Orthodox brothers: the Catholic Church, the Catholic Churches must not get involved in internal matters of the Russian Orthodox Church, nor in political issues. This is my attitude, and the attitude of the Holy See today. And those who meddle do not obey the Holy See. This regards politics. The second thing: piety. It is important that we pray for each other, also in personal prayer. We know new brothers and sisters, and then there is also personal prayer. 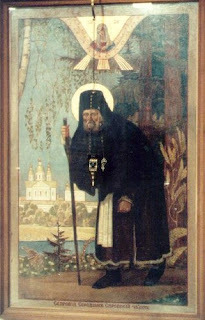 I would like to say something to you: when we met with the Patriarch, afterwards he sent me a relic of Saint Seraphim. I keep that relic on my nightstand, and at night, before going to bed, and in the morning, when I get up, I venerate it and pray for our unity. Thank you very much. Let us pray for each other. Let us bless each other. And let us go together. Thank you. To the Delegation of the Orthodox Patriarchate of Moscow, Vatican, (30 May 2018). 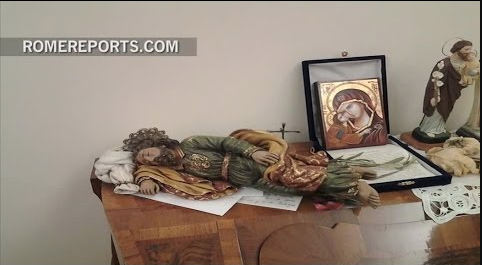 Somewhere on this nightstand is the relic of Seraphim of Sarov that Francis venerates. Cardinal John Dew..."Nothing is to small in the work of promoting Christian Unity.We are restoring that fractured unity piece by piece and each of us has one or more pieces to put in place." From the feast of Ascension. When you read this one sees that they have generally been successful in implementing it. Bases for Jews to enter into relationship with Christians: 1. the need to take a common stand against ignorance, prejudice, bigotry and their violent manifestations on the basis of the affirmation – shared with Christians and other people of faith – of the Divine Presence in our world; 2. the existence of a common agenda indicated by those tenets and values (e.g. the belief in God as Creator , the commitment to the Noachide commandments, the Ten Commandments, as weIl as the expectation of God’s role over the whole earth) which Jews and Christians hold in common due to their shared biblical and historical roots. pg 216/217.